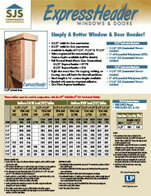 (260) 578-0192 | Simply A Better Window & Door Header! CLICK HERE to download the ExpressHeader product specifications (PDF). 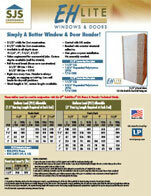 CLICK HERE to download the EH Lite product specifications (PDF). Located near Warsaw, Indiana, our distributor network spans the United States and parts of Canada. Ask your local retail yard to contact the distributor that supplies your area. If a distributor is not available in your area, please contact us directly. Located near Warsaw, Indiana, SJS Components partners with building supply distributors across the United States and Canada. We provide our distributors with the product knowledge, technical information, and literature needed for our full line of engineered wood products. Contact one of our distributors below to find out where the ExpressHeader and EH Lite can be purchased in your area. If a distributor is not available in your area, please contact us directly. Available in a 200 mile radius of Chicago. Available in Michigan, Indiana, Ohio, Kentucky, and Tennessee. Available in North Dakota, South Dakota, Wyoming, Montana, Idaho, and Washington. Distributing the ExpressHeader only. Available in Indiana and Ohio. Are you interested in becoming a distributor for the ExpressHeader or EH Lite? We are currently expanding our wholesale distribution network. Contact Scott for details at (260) 578-0192 or email info@sjscomponents.com.